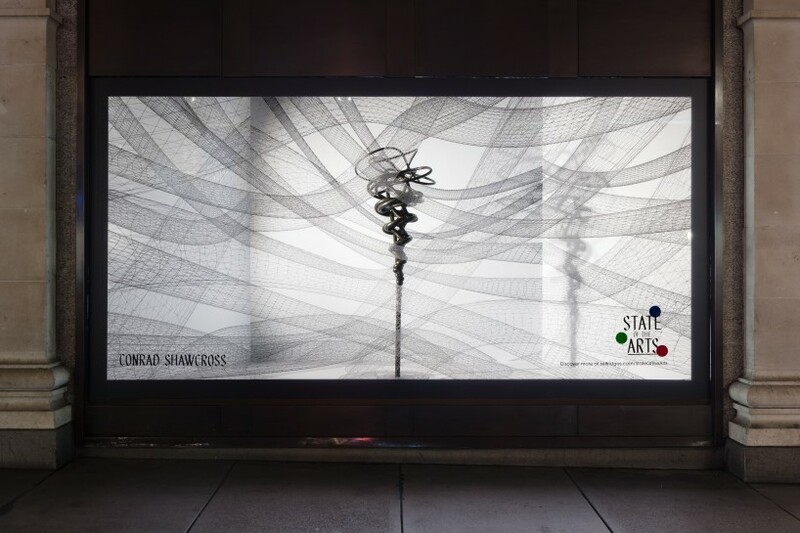 As a foretaste of their Crossrail commissions for the new Elizabeth Line, participating artists have been invited to create windows for Selfridges in Oxford Street, on view until 29 March 2019. Echoing his installation for the new Western ticket hall at Liverpool Street station, Conrad Shawcross’ bronze sculpture, Harmonic Manifold 1 (5:4), is a visual representation of major third. Using this specific ratio between two notes, the piece describes a journey through space as the chord recedes into silence. Using projection mapping, the work is encircled by its own geometry, as if the viewer were inside the form looking outwards. For her Selfridges installation, Chantal Joffe expands on her commission for Whitechapel station, titled A Sunday Afternoon in Whitechapel, which will feature two-metre-tall cut-out portraits inspired by the cosmopolitan streets around the station. Joffe's window features cut-outs depicting her family and friends, as well as historical residents of the East End. Yayoi Kusama’s work for Selfridges anticipates her commission for the new Eastern ticket hall at Liverpool Street station, titled Infinite Accumulation, which features metallic spheres – an evolution of her iconic spot motif – linked and supported by undulating metal rods.